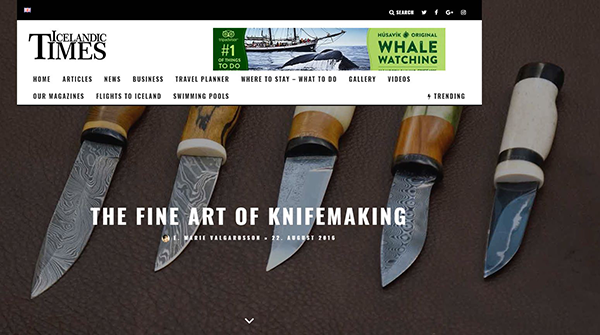 The Fine Art of Knifemaking. Bringing an ancient Viking tradition into the present. 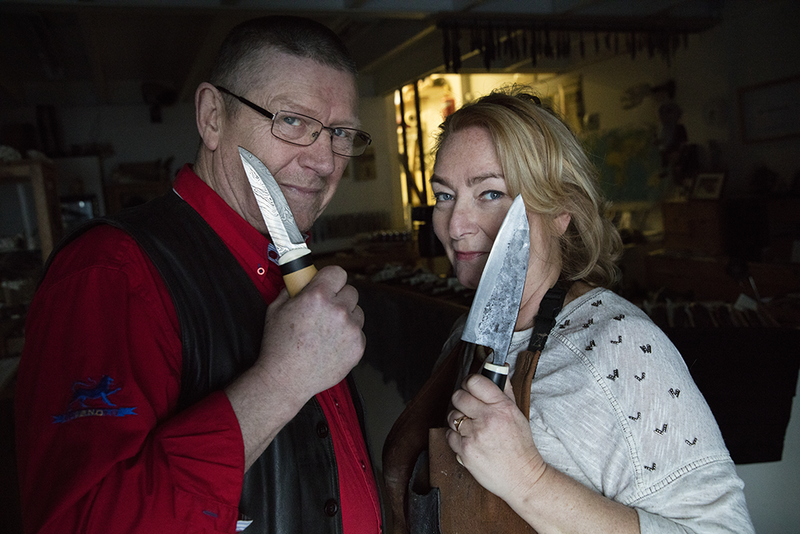 In town of Mosfellbær, master craftsman Palli Kristjánsson and his co-creator Soffia Sigurðardóttir are hard at work in their rustic atelier, where they create an array of knives for collectors, chefs, and all those who appreciate the workmanship that goes into a finely crafted tool. Before Palli and Soffia started making knives they had been thinking about how they can contribute to help our planet earth. Close to their home they have built a compost so as little as possible goes into the garbage. Recycling has always been important to them. 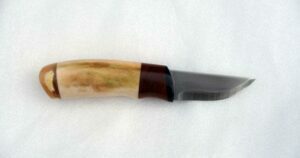 When they started making knives it was very important to them to find materials that they could give a second life. 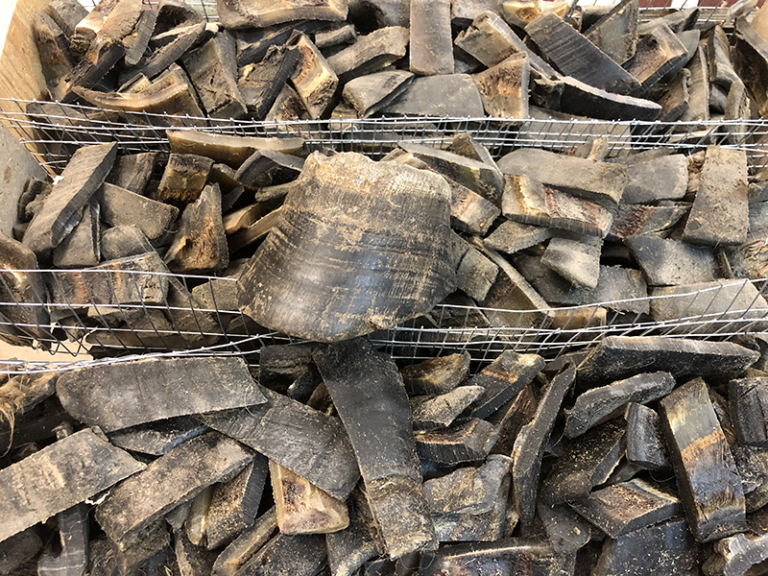 Therefore, they seek materials from the slaughter houses so instead of having the remains of the animals disposed off, they give some parts of them a second life. They use hoofs of horses, horns of sheep’s, cows and bones. Reindeers have been in Iceland since 1771, they were imported from Norway. They loose their antlers once a year. 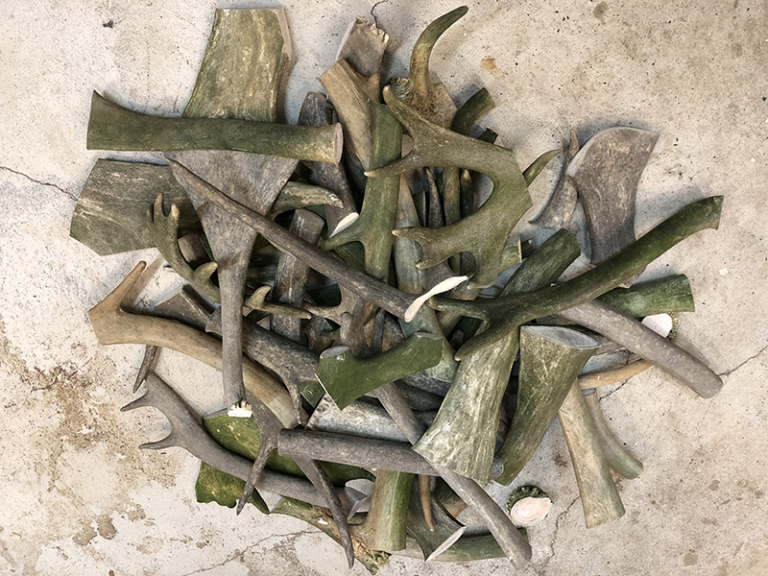 So Palli and Soffia and their friend hike in the beautiful highlands of Iceland collecting the antler that sometimes have been laying in the ground for decade’s picking up the various colored lichen that burns into the antler. They can be for example red, green and brown. The hoofs can be black, yellow and striped. The hoofs have to be boiled for 10 hours in a big pot. Then they need too be cleaned and flattered out while they are still hoot about 100 degrees. After they have cooled down we cut them down into right sizes for us and dry them for a year and a half. Then they are ready too be used. 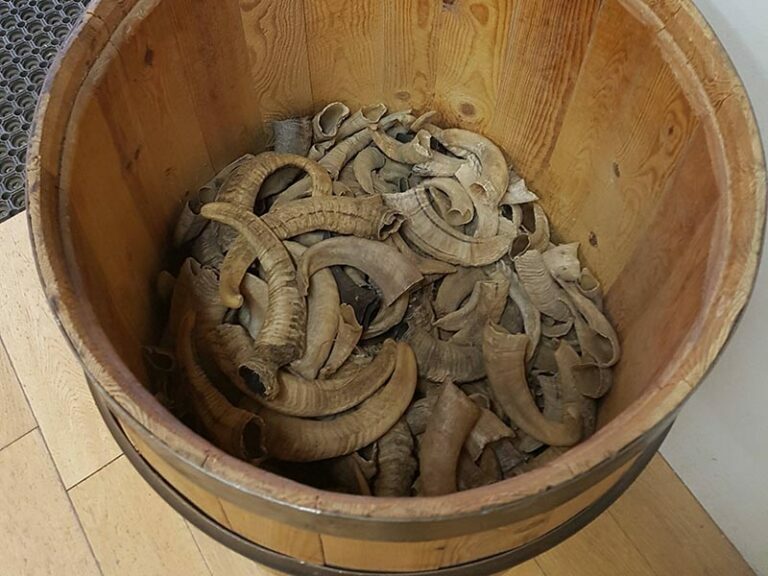 We only use horn from adult rams and sheep. To be able too use horns they need too be boiled at 100 degrees for about 10 hours. While the horn is sill hot we take the bone out of the horn. Then we clean them and sometimes we have too flatten them out. 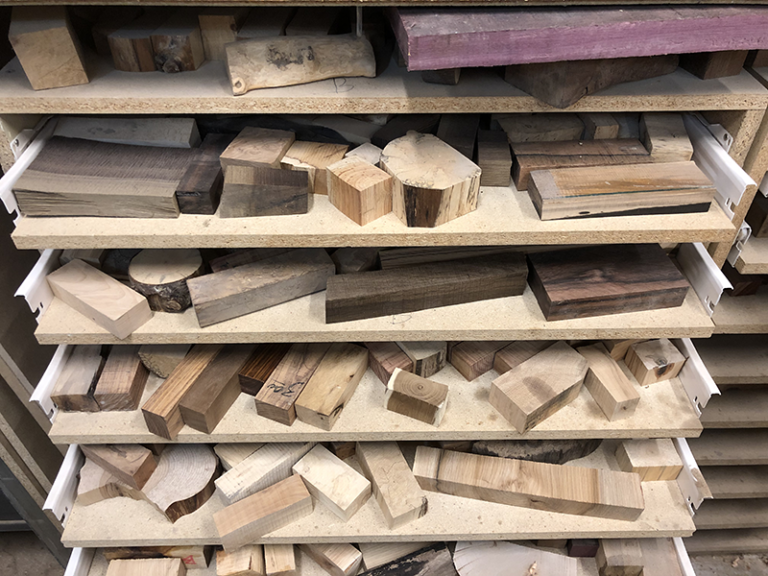 We have to cut them into the right sizes and dry them for a year and a half until we can use them. We have an old joke in Iceland “ What should you do if you get lost in an Icelandic forest” ? The old answer is “Just stand up”. Today this is not the case many people have big gardens with very high trees that need to be thinned. Palli and Soffia are always on the lookout for such gardens and help the trees become beautiful handles for their knives. 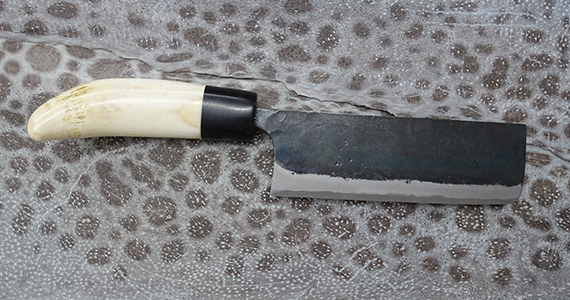 Damascus steel, well known for its durability and razor sharp blades, as well as stainless steel from Denmark, Germany and Sweden are choice materials favored by Palli and Soffia. 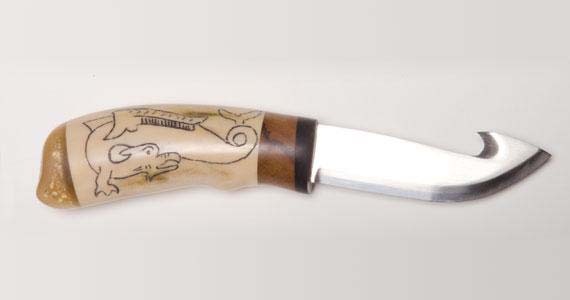 Many of the blades are Viking Age replicas decorated with finely etched designs that are then expertly paired with a handle carved by Palli. 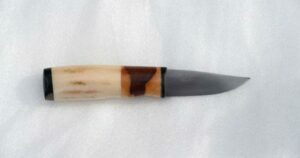 Traditional Icelandic materials are all used to create beautifully carved handles – birch, rowan, horse’s hooves, reindeer antler, goat and sheep horn and even fossilized wood. 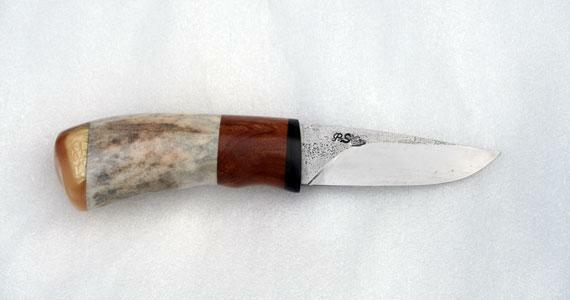 Palli’s knives can be found scattered throughout the world in 85 countries and as collectors items. For her part, Soffia, who has worked under the Palli’s tutelage for several years, has created a line of beautiful professional kitchen knives and her own collection of steak knives and forks which are gaining in popularity. Blades for these knives come in various shapes and sizes (Japanese style, Damascus steel or high carbon steel) and the finely balanced handles make them a joy to use in the kitchen. 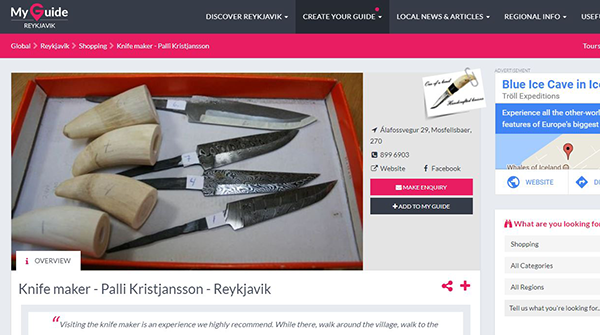 Chefs, cooking schools and cooking enthusiasts tend to love to show off these one of a kind handmade kitchen tools that have become something of a sought after souvenir from Iceland. Do you have your own design ideas or materials that you would like to use, Palli and Soffia are happy to work with you to produce a custom knife made to your specifications. 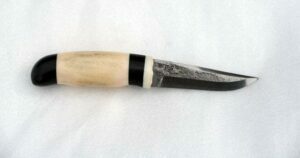 You can also have a look at their collections of sold knives to have an idea of what kind of knife you prefer to be custom made. However every knife is one of a kind, and no two knives are the same. 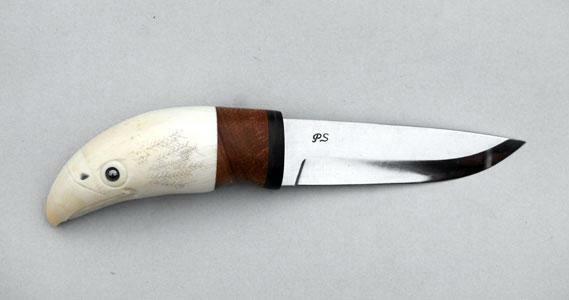 Through the Ages, the agrarian, hunter culture of the Nordic people saw just about every last man carry a knife or dagger in a sheath on a belt. Whether they were tending their land, foraging or hunting for food, or setting out on epic Viking voyages of discovery, the blade played a significant role in their existence. 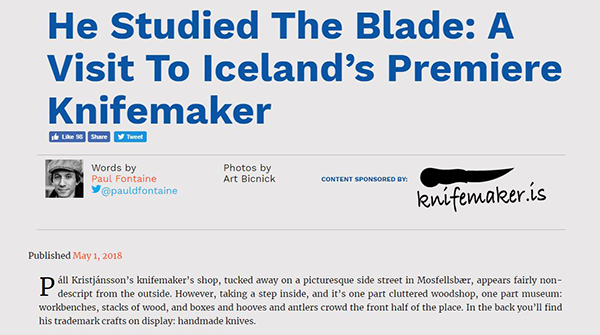 You can find some of our knives for sale at the store Brynja situated at Laugarveg 29, 101 Reykjavik.